The project formally put ideas into practice about modular construction and prefabrication. 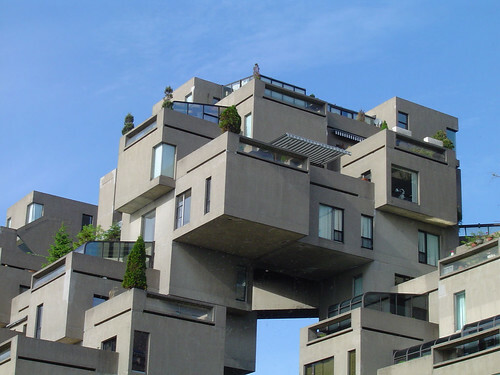 Moshe Safdie’s experimental scheme was very striking and became the symbol for the international Expo 67. The concept was developed at the Mc Gill university. The project has little relation to anything conventional about housing in neither form, type or construction. The focus of the project is upon mass production and modern technology. The dwelling were constructed from prefabricated concrete boxes (11.7 x 5.3m, 3m high) which incorporated a one piece moulded fibreglass bathroom unit with all equipment services and fittings. The units were inserted into the main structure in a ‘tetris’ like adhoc manner. The groupings of units form three pyramid like structures with central lift core giving access to upper levels or pedestrian streets. Dwellings with two, three or four bedrooms were generally achieved over two levels or by connecting the units in a perpendicular arrangement. All dwellings have terraces on the roof the unit below. Financially the project was not successful. Although it may have been had the original 1000 units been constructed (only 354 were constructed). The multitude of arrangements and different connection methods meant more work on site. Complications arose partially due to the size and weight of the component units.